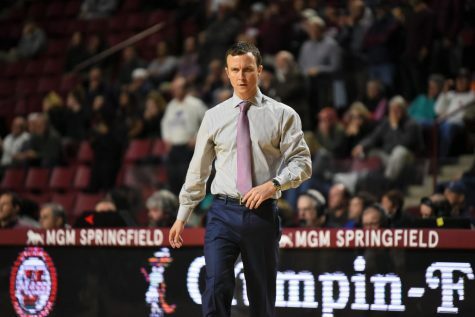 Saturday’s 65-62 loss will go down as arguably the most heartbreaking defeat the Massachusetts men’s basketball team will face this season, but despite what the box score says, it won’t be its worse. 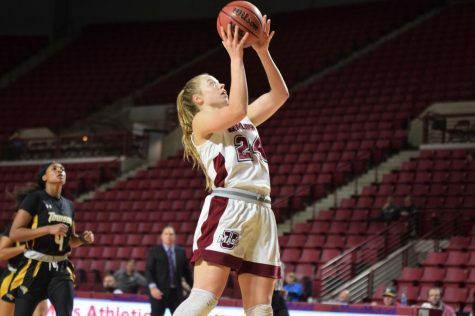 UMass shot just 25-for-72 from the field, including a 10 of 38 clip from 3-point range and made only two of its season-low nine free throw attempts. Outside of Ty Flowers’ 6-for-10 performance from 3, the Minutemen shot just 14-percent from deep (4 of 28). 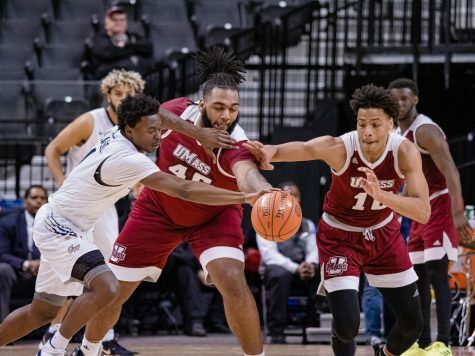 “Man, I don’t know how many good looks you can get in the press after you turn them over or good plays,” UMass coach Derek Kellogg said shortly after being asked if he was happy with the Minutemen’s defensive effort, which he said he was. 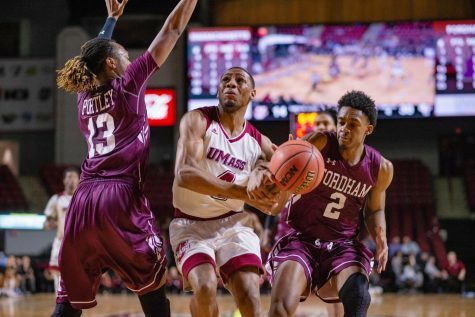 UMass’ (5-2) two losses this season have been by a combined five points, and after being critical of his team’s performance, most notably on defense following its victories, Kellogg acknowledge he’s starting to see some improvement. 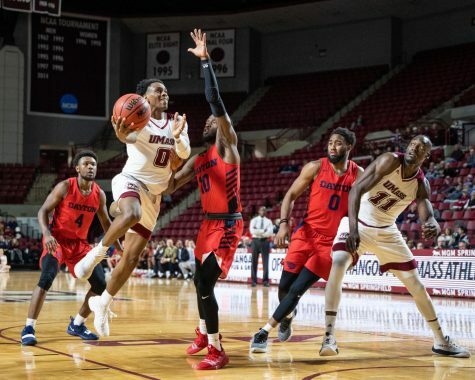 Luwane Pipkins, who entered Saturday’s game third in the nation in steals per game (3.5) and fifth in total steals (21), added seven more on the day with UMass going to its full-court press for most of the afternoon. The Minutemen forced 20 UCF turnovers, 15 of which came via steals. 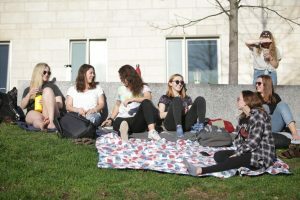 “We trapped better; we’ve been working on that we rotated out we recovered better,” Kellogg said. “Tacko (Fall) being out there on offense kind of creates a different problem for your big guy, ‘do you go, do you not go.’ But I thought we did a lot of decent stuff. 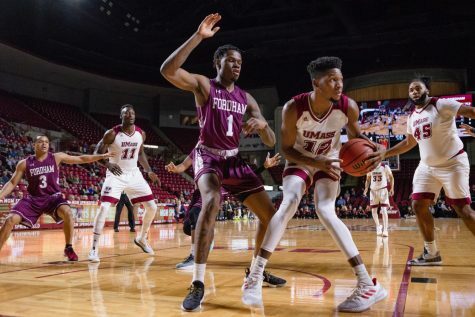 Donte Clark, who tied the game at 62 after making a corner 3-pointer thanks to a generous bounce with 13 seconds left, also felt UMass’ defense looked as good as it has all season. 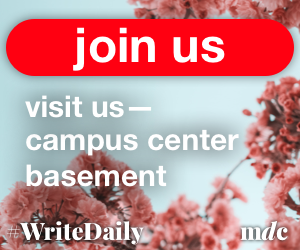 Flowers benefited from playing at the front of the Minutemen’s full-court press where he was often responsible for covering the Knights’ inbounder. He finished with a career-high 20 points and nine rebounds in 26 minutes played after Seth Berger, Rashaan Holloway, Malik Hines and Brison Gresham all got into early foul trouble. 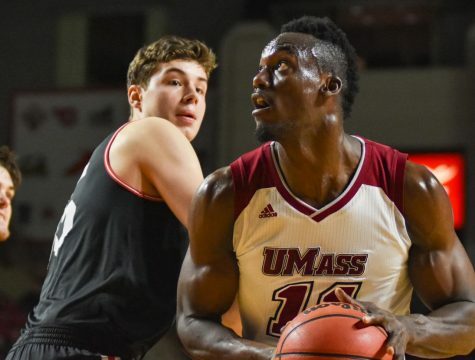 In addition to UMass’ defense, Kellogg was also pleased with how the Minutemen kept the 7-foot-6 Tacko Fall off the offensive glass. Fall finished with 16 total rebounds, however his lone offensive rebound came on a 3-2 UCF fast break where he had a put-back dunk. 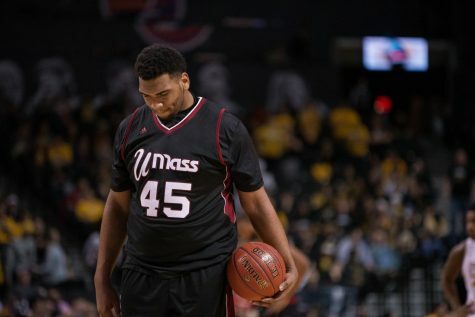 As a team, the Knights had only four offensive rebounds compared to UMass’ 15. 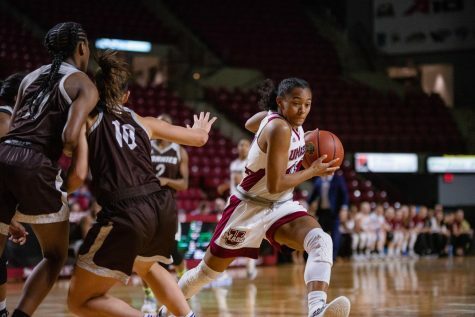 But as well defensively as UMass played against UCF (6-1), Kellogg is feeling the growing pains as the Minutemen progress through nonconference play. 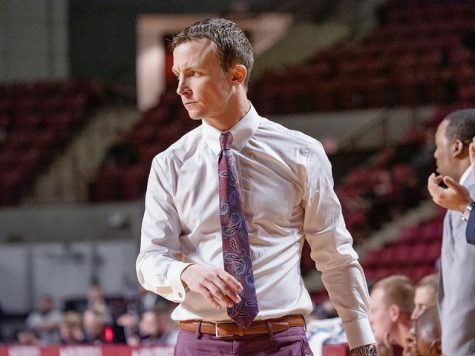 “You know my hair is going to fall out because we did a lot of great stuff and then you do some stuff and you wonder if we practiced yesterday some of the plays,” Kellogg said.